Eight banks designated by the government of Telangana have submitted about six million cheques bearing the names of 57 lakh farmers to its revenue department. The department will distribute the cheques to farmers in the respective gram sabhas, who will then encash these to spend on agricultural inputs like seed, fertiliser and pesticide, ahead of the imminent kharif (June-September) crop season. Termed Rythu Bandhu (farmers’ friend), the Agriculture Investment Support Scheme would pay to every eligible farmer a sum of Rs 4,000 an acre, costing the state exchequer Rs 5,700 crore for the season. This was after it conducted a poll of 60,000 farmers. “We asked them whether they would prefer account transfer or direct cash support. More than 60 per cent responded, saying cash,” Vijaya Kumar, additional director of agriculture, told Business Standard. Poll-bound Karnataka announced a similar scheme in this year’s state budget, with cash support equal to half of what Telangana is giving. 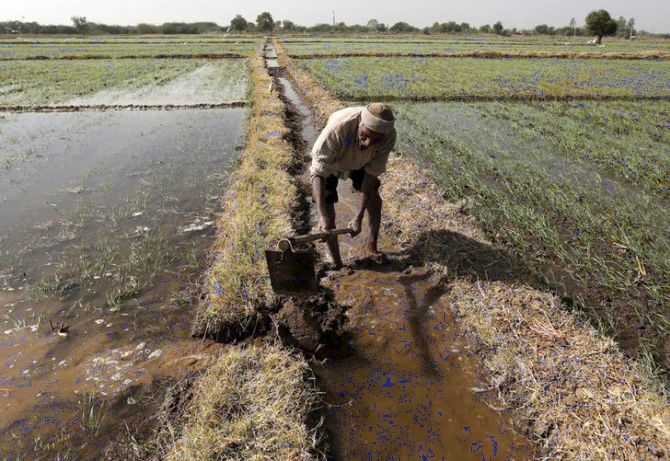 Karnataka plans to pay Rs 5,000 a hectare of cash to only rain-fed farmers, about 3.8 million beneficiaries. Leading political parties have all included this scheme in their election manifesto. Bank officials say the exercise of printing six million cheques was completed in a month. The state is going to reimburse the printing costs. That is only the start of the logistical challenge. “About Rs 6,000 crore would be drawn from various branches in the state in a month, for which we need cash from the Reserve Bank of India, and then transport it to all branches,” said Swaminathan J, chief general manager at State Bank of India (Telangana). The cash exercise apart, accurate identification of beneficiaries was challenging, state officials said. The Land Records Upgradation Programme taken up by the government made it possible. And, promotion of the scheme incentivised the computerisation of accurate land records, making it a win-win for the government in terms of farmers’ welfare and land administration, they add. “We carried out field visits to all villages, verified records in person, and have computerised these. Mapping is yet to be done,” says Vakati Karuna, director of LRUP. Telangana would be the first state to hand over cash to farmers before sowing begins. The scheme is being seen as a potentially stronger option to the Bhaavantar Bhugtaan Yojana (price deficiency payment or PDP scheme) introduced by Madhya Pradesh in last year. If replicated in the country, the cash support scheme would need more money than PDP, says a recent report from the Indian Council for Research on International Economic Relations, authored by Ashok Gulati, Tirtha Chatterjee and Siraj Hussain. It reviewed and compared the two and thinks PDP would be “messy to implement and will distort the markets”. While AISS “seems better, simple to implement, more transparent and inclusive,” says the report. On PDP, the report says less than 20 per cent of the soyabean and only 30 per cent of urad (black gram) produced in the state was compensated under the scheme. Meaning it did not benefit even a third of non-paddy and non-wheat farmers in MP. There is some exclusion in the Telangana scheme, too, officials admit. “Land titles of about eight per cent of the farmers are under dispute of some kind,” said a senior state official. In addition, tenant farmers -- those who do not own the land but cultivate it and pay a rent to the owner, formally or informally -- are not included in the scheme. The Telangana government completed a Rs 17,000 crore farm loan waiver last year; it benefited 36 lakh farmers. The number of farmer suicides from the state came down in 2016 from the earlier two years. Government officials estimate 57 lakh farmers own about 15 mn acres (six mn hectares), taking the average owned by a farmer to 2.6 acres (about a hectare). Average payout per farmer would be Rs 10,000 for this season.